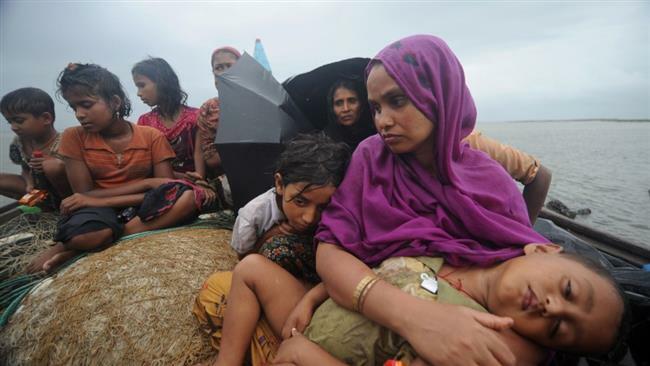 JNN 08 Aug 2015 Burma : The UN has issued a warning over an expected surge of mostly Muslim Rohingya and Bangladeshi refugees heading out for southeast Asia by the end of the month. “UNHCR is calling for urgent action before the end of the monsoon season unleashes a new wave of people leaving on boats from the Bay of Bengal,” spokeswoman Melissa Fleming of the UN High Commissioner for Refugees (UNHCR) was reported as saying on Saturday. Earlier this year, a humanitarian crisis broke out when boatloads of Rohingyas trying to escape persecution in Myanmar were turned back or sent on their way from the shores of Thailand, Indonesia, and Malaysia, Press TV reported. During a press conference held in Geneva on Friday, the UNHCR called on regional governments to avoid a similar humanitarian crisis by implementing steps aimed at boosting search and rescue operations and creating safer places for disembarkation. According to the agency, around 31,000 Rohingyas and Bangladeshis left from the Bay of Bangal by boat since the beginning of the year, a 34 percent rise from the same period in 2014. A total of 94,000 people are thought to have risked their lives partaking in such journeys since 2014. At least 1,100 more are thought to have drowned in the same time period. Myanmar’s Rohingya Muslims, currently living in the western Burmese state of Rakhine, have been subject to systematic repression by extremist Buddhists since the country’s independence in 1948. This is while the government of Myanmar has fallen short of protecting the rights of the marginalized group. Rohingya Muslims have been recognized by the United Nations as one of the world’s most persecuted communities. Myanmar election authorities have banned a Rohingya Muslim member of parliament from running in a Nov. 8 poll that will be seen as a test of the country’s fledgling reform process. Shwe Maung of the ruling Union Solidarity and Development Party (USDP) was blocked from running in his Rakhine state constituency despite being elected there in 2010 because authorities say his parents were not citizens, a claim he denies, Anadolu Agency reported. He added that he would appeal the decision. He had planned to run as an independent candidate after the USDP rejected his application to run on behalf of the party. He also said that his father was an officer in the country’s police force. A rights advocacy group made up of parliamentarians from the Association of Southeast Asian Nations (ASEAN) trade bloc blasted the decision Monday. “The election commission’s claims are beyond ridiculous. And what’s more, this decision actively undermines the democratic process,” said Charles Santiago, a Malaysian MP who serves as chairperson of ASEAN Parliamentarians for Human Rights. “The right to stand for election is as fundamental as the right to vote and cannot be denied on the basis of religion or ethnicity,” he added. The Rohingya minority of roughly one million have faced systematic persecution for decades, but it is only recently that the government has moved to exclude them from taking part in elections. Hundreds of thousands were disenfranchised earlier this year when authorities withdrew temporary citizenship documents, known as white cards, held by many Rohingya. The group, who are linguistically and ethnically distinct from majority Rakhine Buddhists, are officially regarded as interlopers from neighboring Bangladesh and referred to by most in Myanmar as “Bengalis”. In the flawed 2010 election, many Rohingya voted in favor of the military-backed USDP party. Since then communal violence led by Buddhists has forced tens of thousands of Rohingya and other Muslims from their homes and killed hundreds. The violence has been accompanied by a popular hate speech campaign against Muslims spearheaded by prominent Buddhist monks. Protestors have also taken to the streets to call for the Rohingya’s disenfranchisement. In other cases, they have demanded the expulsion of aid agencies assisting displaced Rohingya and condemned the group’s inclusion in a national census. This entry was posted in Asia Pacific and tagged Budhist Terrorist, Burma, Extremist Budhist, Muslim Rohingya, Rohingya, Rohingya minority, Rohingya Muslim, Rohingya Muslims, yangoon. Bookmark the permalink.